This is the story of Beit Sitti, a place that teaches you how to cook traditional Arab cuisine. They also gave us their recipe for Tabbouleh - best of luck! Beit Sitti, My Grandmother’s House, is the cooking school and restaurant that claims to bestow its attendees with the ability to cook like an Arab grandmother. From a neighborhood in old Amman that overlooks the citadel, students are versed in the culinary arts through first-hand experience with a traditional hajjeh (a term generally used as a sign of respect for an elderly woman). Every morning, one of the women who helps run the workshop goes down to the market and chooses the freshest seasonal ingredients, planning for the day’s meal. 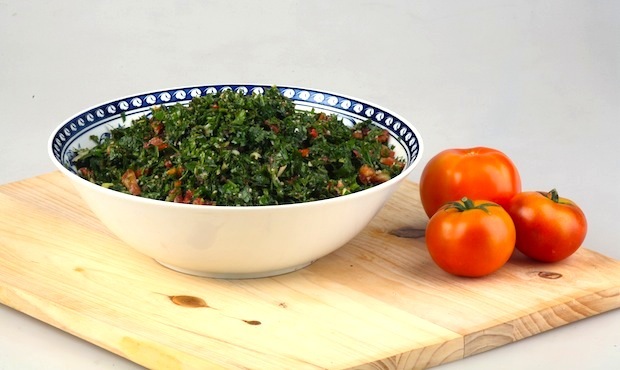 The students arrive around lunchtime and cook four courses, starting with Tabbouleh; a salad made of chopped parsley, tomato, and green onion that is popular in the summer. Next up is usually a dip for the traditional mezze, a main course, and homemade knafeh, the famous cheesy crunch desert. Maria Haddad, the founder of Beit Sitti, greets customers in an apron from behind the stove where some eggplants are roasting. She provides the young charisma in contrast to the hajjehs’ wisdom. The house where Beit Sitti is located belonged to Haddad’s grandmother, who gave her the inspiration for the venture as well as her love of food and, of course, the famous recipes. The key to cooking like an Arab grandmother, according to her, is “being generous with the good stuff.” “Ikrim, ikrim,” urges Haddad over a learners shoulder, be generous, be generous. Haddad has agreed to share her grandmother’s Tabbouleh recipe to help us get through until our next visit. 1. Soak the bulgur in warm water for 5 minutes and then rinse. It will fluff up. 2. Soak the bulgur wheat in the dressing made of 3 tablespoons lemon juice, 3 tablespoons olive oil, ¾ teaspoon salt, ¼ teaspoon black pepper and let it soak for another 10 minutes. 3. Finely chop the parsley, mint and spring onions. Dice the tomatoes and cucumbers into ¼ inch squares. Combine all ingredients together followed by the dressing including the bulgur wheat and mix well. 4. Add ¼ cup olive oil and mix thoroughly again. 5. Check that the amount of salt pepper lemon juice and oil are to your liking and add to your preference. You can garnish with fresh lettuce and use it to scoop the Tabbouleh when eating. Enjoy!